To quote Yogi Berra, its deju vu all over again. We had torrential rains all day Wednesday which melted the snow from the last storm (and flooded my basement). The rain turned to snow and this is what it looked like yesterday afternoon when the snow stopped. Of course, the selection meeting was scheduled for that day. There was no way I could go. I took a break from water removal in the basement with the Shop Vac and shoveling snow in a vain effort to get the car out to walk to Starbucks. I was amused to see many more people shoveling their walks. Lesson learned. The weather caused some problems with mail delivery and there was a delay in getting some of the lessons but all have arrived safely now. Again, please take photos of your swatches before sending them off. CrochetJojo on Ravelry requested this topic. Many independent dyers recommend alternating their skeins of yarn as there might be subtle differences between the skeins. Basically this means you use two skeins at once. In the photo below I have two skeins of Madelinetosh Pairie Color Tart. I bought one of these through Jimmy Bean and the other from a local yarn store. The colors are quite different. If I were to knit up one skein and then join the other, there would be a very distinctive line at the change. I have a couple of options. I can alternate the skeins for the whole project. (This is also a good idea if you are using a yarn which is giving you an unattractive pooling pattern.) Or I can alternate the yarns for several inches when I am close to running out of the first skein. Yes, there will still be a difference but it will be less noticeable. I can be quite lazy and depending on the project, I have just started the new skein and not worried. I have done this for sleeves and it has not been a problem. 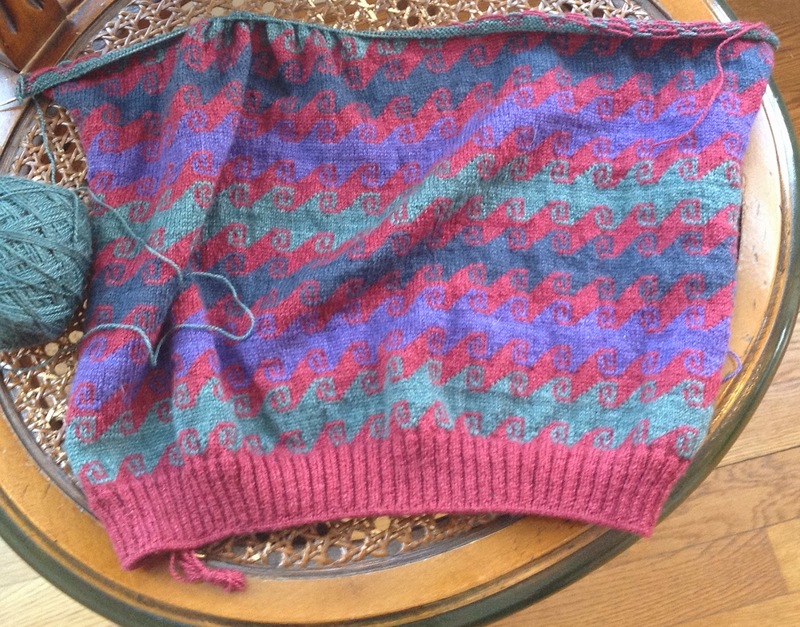 The photograph below shows two ways to alternate the skeins. At the bottom of the swatch I have worked two rows in each colors. This means that I am carrying up the yarn at the selvedge. This makes the selvedge thicker. If you are doing this on a piece which will be seamed it isn't that big of a deal. The left side of one piece will be seamed to the right side of the other so the seams on both sides will be the same thickness. If you are doing a scarf or shawl which will not be seamed, this is more of an issue. One thing you can try is the technique for single rows stripes (as shown at the top of the swatch). I've done a blog entry on this before. You do not carry the yarns up the selvedges. With this technique you work a knit row with Skein A. You don't turn the work. You then join Skein B and knit the next row. You then turn and work a purl row with Skein A. You don't turn the work. You purl the next row with Skein B and so on. This technique works just fine with simple stitch patterns. If the pattern is more complicated, like lace or cables or if there are increases and decreases, you have to track the pattern very carefully as you will be doing some of the techniques on purl rows. Anything you do on a RS row you can do on a WS row but you will have to alter the technique. This can be a real pain. What I do when I am faced with this issue is that I swatch. 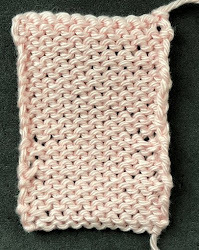 I knit up a swatch with the two yarns, not alternating colors. I then look at the swatch in different lights. I have generally found it isn't that big of a deal. For a garment, if I am worried, I do the back with one skein the fronts with the others...or the sleeves. I have even been know to decide that the color change is a "design feature" in a very complicated lace pattern. I have used this technique to avoid pooling which I detest. Alas, the roads are even worse! No salon this week. I am well on my way. The light has altered the way the colors look. They are much deeper.